…..if the universe responds with creating the things where you put your attention then is it better to point out what is wrong in the world or to point out what is right? Is it Pollyanna to attend only to the positive? 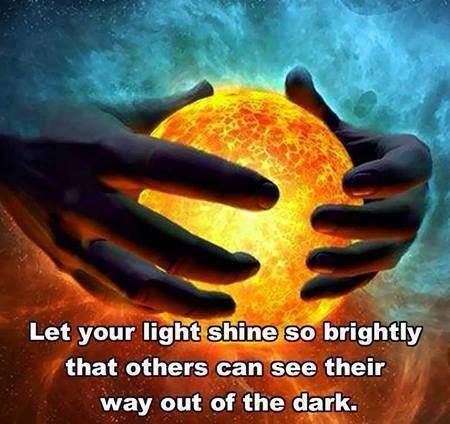 the light?…..
…holding the attention and tending to what you want and seeing that completed, changed, and present in the now is essential for living in the light and upleveling consciousness. These are challenging, interesting, beautiful times… embrace each perfect moment and link these together to see your world perfectly enlightened. As I encourage the upleveling of consciousness, I ponder the concept of duality and unity. How might shifting from duality to unity appear or present itself in my everyday world and environment. What might I experience within myself? How might I look, sound, and be? What might I reflect? Duality feels right/ wrong, good/bad, or light versus dark separating out along continua of opposites. Unity feels all encompassing, embracing, holistic, and inclusive; whorls or inclusive wholes. When I align with the strength of living in the light, my presence is joyful, happy, and offers the aura of fulfillment. I radiate a sense of peace. I observe others drawn to me and the light opening hearts to increase internal joy. Living in the light and shining in this way brings to me even more of that enlightened power and inner strength. What I notice is that this is simple and easy, like breathing when all is peaceful and light around me. When I am faced with a fear-promoting situation, negativity or an experience of attack from without my capacity to remain in the light is challenged. I reactively shift into the habit of vigilance, thinking, analysis, defense as a protective response. But when I lower my energy to that of mind alone I feel myself isolated and disconnected – fear immediately surrounds me…lowering, my vibration. This disconnection and heaviness feels deficient of light. When I am living in the light and responding with my internal sensory guidance system I immediately notice the shift and can apply my mindful focus on how I have changed and what preceded the shift to address what has triggered my defensive reaction. Once aware of the event I can reset my place in the light. This issue of duality feels like a software upload, in order to shift into unity the software in my thinking and action relationship has to be updated to include mindfulness. So even writing about my experience of moving from duality to unity is dualistic… from negativity to positivity. Utilizing the element of fear or judgment to encourage the upleveling of consciousness is a mistaken action. It pulls on the precise element of duality that you are trying to uplevel, and so creates a type of wobble in your consciousness. Being joyful, secure, inviting and compassionate uses the action of love to encourage enlightenment. Gandhi said: Be the change you wish to see in the world. He was encouraging embracing the responsibility for change personally in order to shift the culture or environment one being at a time. Stephen Covey: Wrote (in the 7 Habits of Highly Effective People) that in order to create change in your own relationships you should change have to be… so that what you wanted to have in your relationship you needed to be in your interacting style, first. I realize that if I want to encourage living in the light I need to live in the light and telegraph that light through all my senses so that simply being in my presence another might feel the light and shift within him or her self. In order for the consciousness of beings on the planet to change those leading the way must change have to be, and be the change of enlightenment. Living in the light is living in compassion, lovingkindness, and forgiveness, with the attitude of gratitude. Shifting perspective to see the positive in the darkest places to bring light to each; to see the flow between and the whorl of both together so that my and your experience of light can shift consciousness to make mindful, collaborative, connecting healing choices. use Verbal aikido to deflect, deflate, and define (reset or redefine) negativity and experience of duality into unity. Categories: Balance of Spirit Mind and Body category, consciousness development, Paradigm shifting, spiritual development | Tags: attitude of gratitude, change, consciousness development, instinctive health, living in the light, security, spiritual development, unity, upleveling consciousness | Permalink.